Part of a Vishay datasheet. There are many misunderstandings about measuring electrolytic caps and their ESR. 99% of the ESR meters are hobby instruments and more indicators as meters. However they can be usable if you understand how to use them and what they measure. They are more or less only populair in commercial consumer stuff repairs and hobbyist who do the same. Have you ever seen a Keysight or Fluke ESR meter ? Good LCR meters can measure ESR, or better AC resistance, at several frequencies. 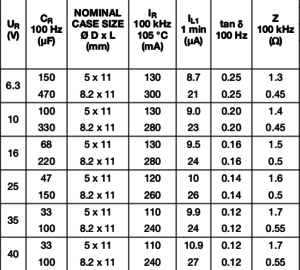 But also measure the more important D.
Datasheets most times state the capacitance at a stated frequency, impedance Z at 100 kHz (Z is not ESR) and the dissipation factor D (= tan δ = DF) the max allowed ripple current and the min/max values over time for these parameters. Often a multiplication factor for the current at different frequencies. You can measure in circuit, but the problem is that it is non-conclusive. A high ESR will most times be a bad cap. The problem is that if you measure a low ESR, it not always is a good cap. If there are good caps parallel (common on power rails) a cap with a sky high ESR will still measure good. Besides that, you do not know how to interpreted the measured value. You need some table but the once you find on the web, differ so much, they are of little use. Best way to go is make your own but the problem is that f.i. a 100 uF cap A from brand B is new 0.1 ohm and the 100 uFcap C from brand D is 1 ohm new. So a D of 1 is bad for the first one, but good for the other one. People who made the tables on the web have the same problem as you will have. They are practically based on nothing. If you repair TVs you often know the problems or can find info on forums or databases from your company and then an ESR meter can speed up things. You then probably now cap C4 must read under 0.3 ohm in situ. Use it only to find the really dead once, in repairs that will not power up. Replace them and if that does not help, desolder and test the rest. If that does not work either…do some real trouble shooting. – Take a LCR meter that gives you D (=tan d). – Measure C, is it within specs ? often +/- 20% when they are new, how low the circuit tolerates is an other question. – this did not help ? Do some real trouble shooting with things like a scope and multimeter. I only repaired 3 TV’s and non of them had dead electrolytics. (a shorted 1 nF 1kV cap, a dead 4 MHz Xtal and a shorted mosfet) but my satellite receiver needed over 40 new caps. – Then decide witch table could be the correct one. – look up datasheet, note impedance Z at 100 kHz. – if the measured Z is withing the stated specs, the cap is good. – if Z is within the stated specs from the manufacturers datasheet, the cap is good. – if there is to much ripple, replace the cap. – how high the ripple is allowed to be is stated in the service manual of the thing you repair. – if it is not stated you must estimate that. Not to hard, measure on the Vcc pins of some components. You can do that if you want to quickly find the real dead caps in something that is so dead you can not start it. Then remove and measure them using one of the ways above. Then start the normal trouble shooting. This entry was posted in Theory about measurements. Bookmark the permalink.